Managing large numbers of emails can be time consuming, but one way to help tackle email on the Mac is by setting up an Unread Emails Only inbox. This allows Mac users to easily view unread mail messages without having to scroll through already read emails, since only the new or unread emails will be visible. The great thing about this approach is that it spans all inboxes and email accounts that are setup within Mail for Mac, though you can certainly specify accounts if you wanted to. 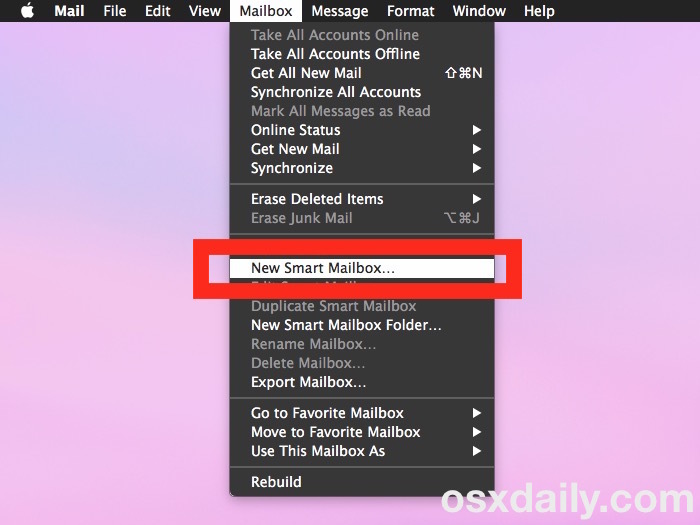 We’re going to demonstrate how to setup a smart mailbox in Mail for Mac OS X that will be used to view unread emails exclusively. All of your regular emails will still be intact in the regular inbox, the smart mailbox is essentially just a presorted inbox. As unread messages are marked as read, they will leave the unread inbox automatically, making the smart inbox perfect for managing backlogs of unread emails. This method relies on creating a smart inbox that will display only unread email messages for any and all accounts setup within Mail for Mac. When “Unread emails only” (or whatever you named the inbox) is selected, only the unread messages in your Mail app will be shown. Unread emails in Mail app are signified by the blue dot that appears next to the email within the inbox, and in this case all of the mail messages will show the blue dot because they’re unread. If you have no unread email messages, this smart mailbox will be empty. Switching between the smart mailbox of Unread messages only, and between your regular inbox and mailboxes is just a matter of choosing the inbox to use from the left sidebar in Mail app as usual. Of course this approach is for Mac Mail app, but iOS users can also view only Unread email on iPhone and iPad with a special Unread inbox. Additionally, if you’re a webmail user you can show all Unread messages in Gmail using a simple sorting trick as well. Know of any other helpful Mail tips? Let us know in the comments. i will never understand this headline as long as i live! LOL, it enables an alternate mailbox in Mail app for Mac that only displays emails that are “unread” status. 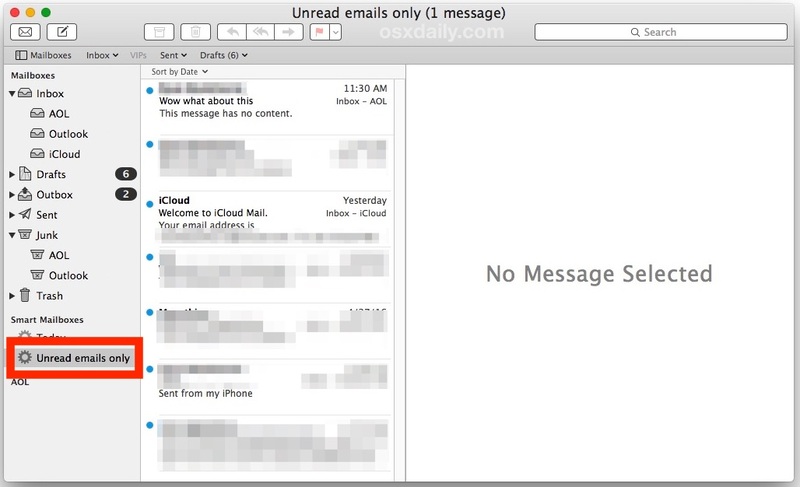 Thus, it shows unread emails only, in the Mail app for Mac. Thanks for link to the post on finding unread Gmail. It works perfectly. It drove me crazy trying to find unread mail. Brilliant – I was just in the middle of checking 3 separate accounts and wanting to delete repetitive unread emails and voila – your solution was the next email I opened. THANKS! In my regular Mail, my blue dot for “Unread’ never vanishes when I have opened and read it. All mail, whether ‘read’ or ‘unread’ shows that blue notification dot, and I can’t get rid of it!!? This problem just started a few days ago, and the Apple people couldn’t figure out how to solve it. Thanks for this. I’ve always been a little tweaked by the fact that there was no built-in view to only show unread messages in Apple Mail. Your instructions were super clear/easy and it took all of 10 seconds to set up. Now I can just go straight to my unread messages every day and I’m happy. I tweeted your link so that others like me can find this easily too. Great Solution. Thanks for this useful tip. It also taught me how and what a smart mailbox is. Hi – I tried this solution, opening a new Smart Box etc. The box was created, and indicated that there were 90 unread emails – ie the number beside the name. Only problem, none of them appeared! What do you suggest now?